FLORHAM PARK, N.J., Oct. 7, 2013 -- Tosh Farms of Henry, Tenn., a leading producer of pork and grain, has been recognized with the Customer Diversity and Inclusion Award from Zoetis. The annual award recognizes customers who promote an environment exhibiting inclusive behavior and respect for all. Lucina Galina, DVM, PhD, Pork Technical Services, Zoetis, nominated Tosh Farms for this award after working with owner and CEO Jimmy Tosh to engage the swine farm's growing Hispanic workforce and offer all employees the best chance of success at the farm. "As the number of Hispanic employees continues to increase on his farm, Mr. Tosh expressed his interest in laying a foundation to increase engagement and productivity among all his employees," Dr. Galina said. "Mr. Tosh began with a thorough review of his operation to identify the areas needing improvement." With help from Zoetis, the review recommended ways to improve hiring, on-boarding and training for both English- and Spanish-speaking employees, such as training in an employee's native language. Tosh also looks forward to enrolling his managers in the PeopleFirst™ program to help with increasing employee engagement, decreasing turnover, increasing productivity and improving animal care throughout the farm. "I am truly honored to receive this award," Tosh said. "I want to do what's right for my employees, for my operation and for our future. I am very thankful for all the help that Zoetis has provided me." "I recently interviewed several employees at Tosh Farms," Dr. Galina added. "They are grateful for the opportunity to work for Mr. Tosh and the inclusive, family atmosphere that's developing. Mr. Tosh has plans for additional programs to help his operation and continues to ask for more recommendations that will add to the farm's bright future." The Zoetis Customer Diversity and Inclusion Award was developed through the company's Diversity and Inclusion Council, which is comprised of all U.S. business units that are dedicated to improving education and diversity for the company and its customers. Zoetis is the proud sponsor with the Smithsonian Institution Traveling Exhibitions and the American Veterinary Medical Association of the mobile educational exhibit Animal Connections: Our Journey Together. Families visiting the exhibit will explore the vast bonds between people and animals and learn about the important role veterinarians play in protecting animal and human health. For more information, visit www.zoetis.com/animal-connections-tour. 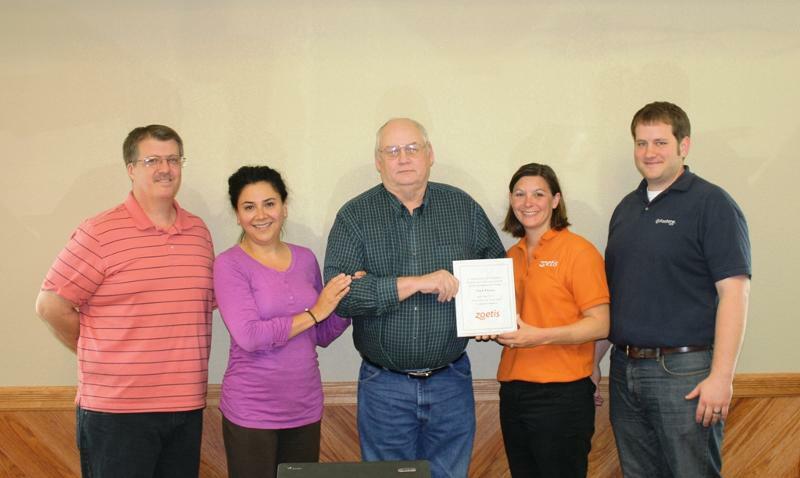 Tosh Farms of Henry, Tenn., is presented with the Customer Diversity and Inclusion Award from Zoetis. Those attending the award presentation included Danny Ham, Personnel Manager, Tosh Farms; Lucina Galina, DVM, PhD, Pork Technical Services, Zoetis; Jimmy Tosh, owner and CEO, Tosh Farms; Lisa Naive, Account Manager, Zoetis; and Seth Krantz, DVM, Staff Veterinarian, Tosh Farms.